This tour explores geodesic remeshing of surfaces. 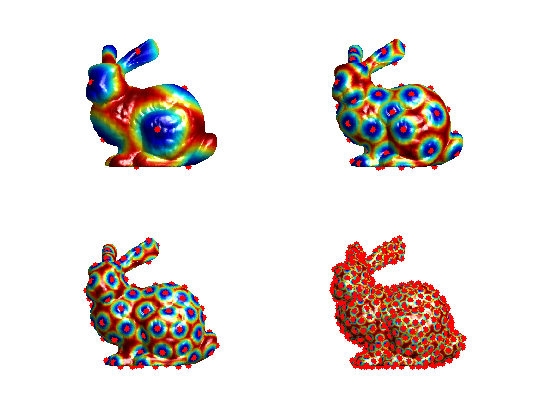 Geodesic Remeshing Using Front Propagation Gabriel Peyré and Laurent Cohen, International Journal on Computer Vision, Vol. 69(1), p.145-156, Aug. 2006. 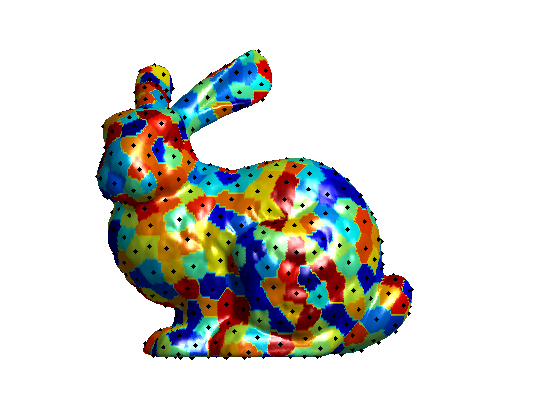 An uniform sampling of points on a surface is obtained using a greedy farthest point sampling. Compute the geodesic distance to this point. Display the geodesic distance to the point. Select as the next sampling point the farthest point. Update the distance map using a local propagation. Display the update distance map. Exercice 1: (check the solution) Perform the farthest point sampling of m=500 points. An intrinsic triangulation of the point is obtained using the geodesic Delaunay triangulation. Compute the voronoi map Q of the segmentation. Count the number d(i) of different voronoi indexes for each face i. Select the faces with 3 different indexe, they corresponds to geodesic Delaunay faces. Build the Delaunay faces set. 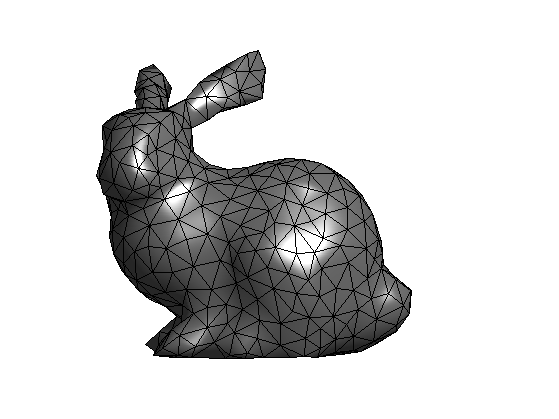 Position of the vertices of the subsampled mesh. Re-orient the faces so that they point outward of the mesh. 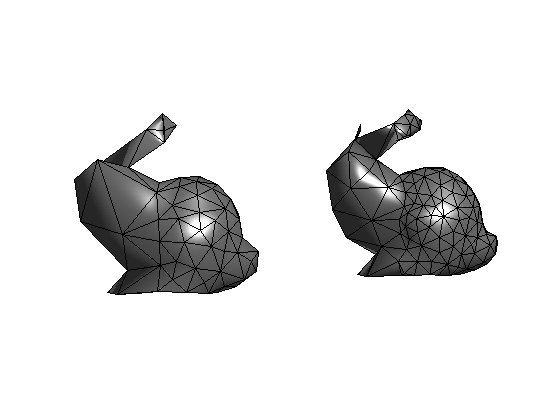 It is possible to seed more point on a given part of the mesh. Create a density function by designing an isotropic metric. Here we use a metric that is slower in the left part. Perform front propagation using this speed function. Exercice 2: (check the solution) Perform a spacially adative remeshing. A better remeshing quality is obtained by sampling more densly sharp features. This is achieved using a spatially varying metric, so that the front propagate slowly near regions of high curvature. Compute the curvature of the mesh. Exercice 3: (check the solution) Design a metric W so that the sampling is densed in area where C is large. Exercice 4: (check the solution) Use such a metric to perform feature sensitive remeshing. Tune the metric to reduce as much as possible the Hausdorff approximation error.